Jamestown City Councilman Andrew Liuzzo (R-At Large) (Center) announced his intention to run for Mayor in the 2019 election on Saturday, Feb. 2, 2019. JAMESTOWN – Jamestown City Councilman Andrew Liuzzo (R-At Large) on Saturday announced his intention to run for mayor of Jamestown in the 2019 Election. 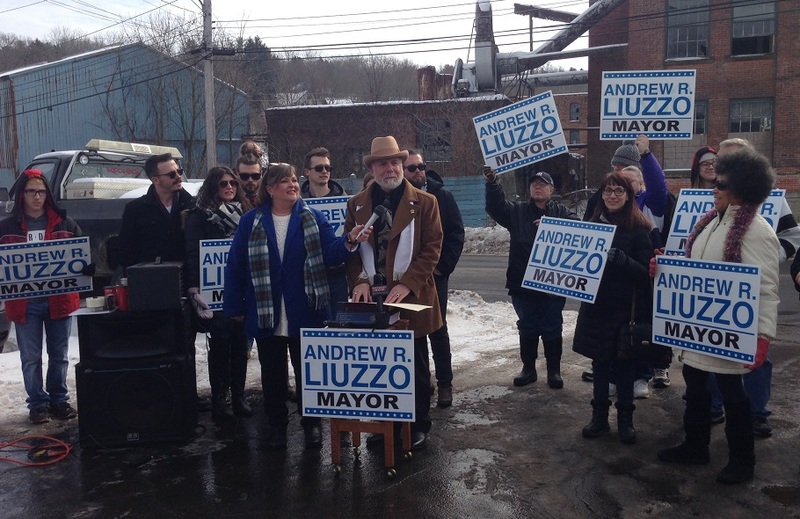 Liuzzo made the announcement at A1 Auto on Harrison Street with more than three dozen supporters in attendance. In his announcement speech, Liuzzo said its time for new leadership in the city that will help to bring balance back to city government. He said that during the past three decades there’s been a shifting of power in city government away from the city council, with the office of mayor gaining power. To illustrate his point, he displayed copies of both the original city charter and most recent version of the charter, which appears much larger. Liuzzo also pointed out several challenges the city faces that have not diminished in recent years but have instead only grown. They include a lower-than-average housing values, a higher-than-average crime rate, property taxes that have reached the highest level allowed by state law, and a shrinking population with an ever-increasing number of residents living at or below the poverty level. Liuzzo said his vision for the city is to empower residents and make the city a place where people want to move to, not move away from. “I’d like to see Jamestown be a place where our young people stay. Where they can start their families. Where they can have better paying jobs. A place where the people who have moved out might want to come back. We can not establish ourselves as a national destination until we empower the residents who already live here,” Liuzzo added. While Liuzzo acknowledged that some ground has been made in reviving the local economy, he said the current administration is too focused on just the downtown of the city and not on the other outlying areas, such as the city’s east side. 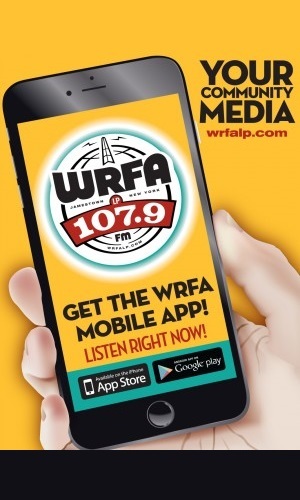 He said if elected, he would focus more attention on those areas that serve as a the gateway into the downtown, making the city appear more welcoming to both residents from the greater Jamestown area as well as visitors. Since joining the city council in January 2018, Liuzzo has been the only member of the nine-member council to be critical of current Mayor Sam Teresi, a Democrat. The current composite of the council is five Democrats to four Republicans. Among the items Liuzzo has been critical of and voted against is the process by which mayoral appointments have been vetted and approved by the council, a parking contract with for 40 spaces with Lynn Development, and the 2018 city budget, which did not receive any amendments from the executive proposal presented by the mayor. Of all the voting sessions that took place in 2018 and with dozens of resolutions brought before the council for consideration, Liuzzo was the only city council member to cast a “no” vote – which he did eight different times. A lifelong city resident, Liuzzo is a 1971 graduate of Jamestown High School and former owner of Yankee Painter & Wallpapering, Inc. – which operated for 20 years. He has been a physical therapist for the past 15+ years, although he stepped away from doing that full time since being elected to the city council. In addition to his work on the council he currently works part time for the Chautauqua Area Regional Transit System (CARTS). Liuzzo is the father of five children, all of whom live and work in Jamestown, and is married to M. Christina (Tina) Turnquist Liuzzo. Liuzzo is the first candidate to announce their intention to run for Mayor of Jamestown. Jamestown Mayor Sam Teresi, who was first elected to office in 1999 and has served five terms as mayor, has not said yet whether or not he plans to run for a sixth straight term. Best wishes for successful run. So much to be done. Best wishes.